These bars certainly aren’t sugar-free, and they have more than just whole grain oats and oat flour, but it can be so fun for a gluten free family (or just a gluten free child—or adult!) to eat what “everyone else” can have. The crust on these bars is perfectly tender and chewy, and only lightly sweet, so the strawberry filling seems just right. But sitting down to a nice hot bowl of oatmeal isn’t always possible. Anything I can make ahead and have the kids grab on their way out the door is a win. The whole “busy family” thing sounds so cliche, but it’s really true! The biggest trick with baking these bars is keeping the filling from leaking out onto the baking sheet during baking. First, know that some filling will most likely leak out. Preserves are relatively thick, as far as jams and jellies go, but they still melt in the oven. I’ve got some tricks for keeping the filling inside the bars, though. Keeping the shaped and filled bars cold before baking will help quite a lot. The longer the dough itself takes to spread at all in the oven, the better. As written, the recipe makes a relatively stiff dough, which helps to lock in the filling. You don’t want the dough to be so stiff that it’s a struggle to knead or roll it out. But if you keep it from being too soft, it will help do its job better. Dairy-free: To make this recipe dairy-free, you need to replace both the nonfat dry milk and the yogurt. I’ve replaced the nonfat dry milk successfully with powdered coconut milk (Native Forest is a good brand), and the for the yogurt I’ve used plain coconut milk yogurt. Both were easy, successful substitutes. Egg-free: There’s only one egg in this recipe, and it really does help hold the ingredients together. But it could probably be replaced with a “chia egg” (1 tablespoon ground white chia seeds + 1 tablespoon lukewarm water, mixed and allowed to gel). Oat-free: In the U.S., there are certified gluten free oats that are grown on dedicated fields. We use them all the time. I buy them as whole rolled oats and grind them in a blender or food processor a bit for “quick oats” and more fully for oat flour. If you can’t or would rather not have oats for any reason, though, they can be replaced in gluten free baking. Click through that link to read all about my suggestions for replacing each grind of oats. The short answer is that the oat flour should be replaced with quinoa flakes and the old-fashioned oats with beaten rice. 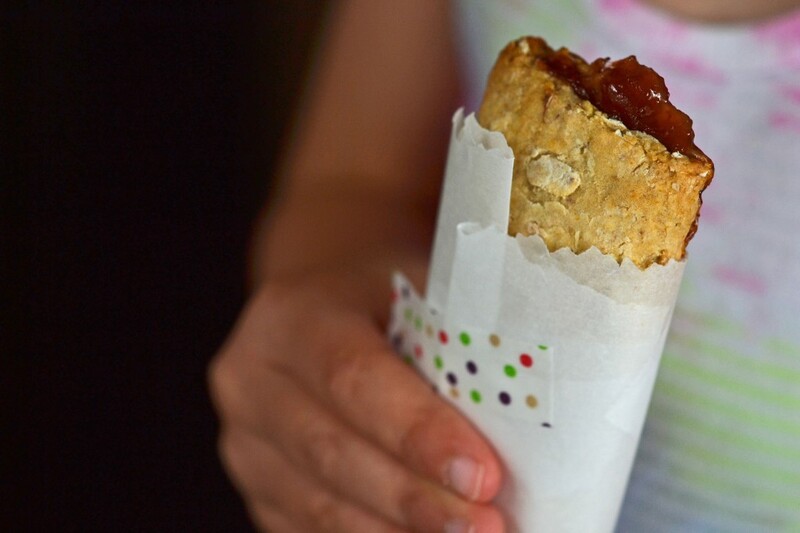 If you’d like an oat-free version of breakfast bars, try my homemade cereal bars. They’re made with crisp rice cereal instead of any form of oats, and they’re a family favorite, too. Sugar-free: I haven’t tried making this recipe without the 3/4 cup of granulated sugar or the regular strawberry preserves. If you’d like to make the recipe with unrefined sugars, you can try replacing the granulated sugar with coconut palm sugar (just grind it into a finer powder first) and be sure to use no sugar added preserves. To make the recipe sugar free entirely, you can try replacing the granulated sugar with Swerve brand granulated sugar substitute. Those sugar substitutes tend to be drying, though, so you’ll almost certainly need to add more water to bring the dough together. The preserve filling can be replaced with sugar-free preserves. In a large bowl, place the flour, cornstarch, nonfat dry milk, oat flour, baking soda, baking powder, salt, oats and sugar, and whisk to combine well. Create a well in the center of the ingredients in the bowl and add the yogurt, oil, vanilla, egg, and water, and mix to combine. If necessary to bring the dough together without crumbling, add more water by the teaspoonful. The dough will be sticky and somewhat stiff, but not dry. Transfer the dough to a lightly floured surface and roll it out into a rectangle about 1/4 inch thick. Using a sharp knife or pastry wheel, trim any rough edges of the dough and cut out 4-inch squares, gathering and rerolling scraps as necessary. To shape the bars, place about 2 tablespoons of strawberry preserves down the center third of each square of dough, and fold the ends over each other to cover the filling. Pinch the ends of each bar together to seal. Place the shaped bars about 2 inches apart from one another on the prepared baking sheet. Place in the freezer or refrigerator to chill until firm. This will help prevent the filling from leaking out of the dough during baking. Remove the baking sheet from the refrigerator or freezer, and place it in the center of the preheated oven. Bake until the bars are very lightly golden brown and slightly darker around the edges, about 15 minutes. Allow the bars to cool on the baking sheet until firm. If any filling has leaked out (and likely some will), once it’s cool, the preserves can be peeled off the parchment paper. Originally published on the blog in 2012. Recipe modified and published on page 221 of in Gluten Free Classic Snacks; photos mostly new, video new in 2018. Am I missing something in my recipe, because I can’t see where it calls for banana and yet it has been mentioned in the comments? Hi, Mary Jo, the recipe used to call for bananas, but it’s been modified and no longer does. So I went to go make these today and then I noticed that the pastry flour calls for dry milk. I try to be as dairy as possible (the little ones are). I have “Better than Milk” powdered soy….oops deathly allergic to that. Ok, almond flour has been a good dairy free alternative in small amounts, oops deathly allergic to that too! Darn, what can I use?? So I brainstorm and I come up with trying shredded coconut, finely processed in my vitamix. I have seen coconut milk powder and I have used coconut cream in your dairy free white chocolate recipe. We will see if it works. All the dry components are ready to go. I will let you know Nicole. I did a google search like you said – the best looking one that came up was yours! You always make pretty food – well, at least what I see on the blog :). When my family moved from CA to OK a few years ago (we hadn’t gone gluten-free yet) for some reason all we bought for the trip were gluten-filled Nutri-Grain bars and canned ravioli. Yuck – those bars sure wore out fast, and cold ravioli . . . nobody likes. Blah. But, I’m sure these gluten-free ones would taste a lot better! Thanks so much for this recipe – I was afraid I’d have to devise one myself! Having tried commercially-available gf cereal bars, I thought I’d never have good ones again, but these look great. I’ll have to go out and buy bananas, as I don’t have any, and maybe some jam, as it’s not something I have a lot of in my fridge. Or maybe I’ll just mix my favourite blackcurrant jam with fresh-made applesauce. In any case, I’m now looking forward to having a quick, eat-out-of-hand brekkie. Cheers! Jam and fresh applesauce sounds great, Carol. Just be sure to reduce the applesauce well so that it doesn’t have much of any liquid left, or it will leak. You want something thick that holds its shape for the filling. One way or another, sounds like you’ll make it work! Have a told you lately that I love you! Well I do. A must make on my bucket list! You definitely can’t just leave it out, Kara. You’ll have to experiment. Maybe try chunky applesauce, by weight. I’m looking forward to making these with different fruit fillings…maybe even chocolate or a cream cheese filling! So many possibilities!!! Thanks, Nicole, for taking such good care of our GF baking needs & desires & showing us all the possibilities available! Oooh chocolate sounds like a great idea, Peggy. I’d go with a mix of chocolate and something else, though, or it will harden after they cool and you’ll need to eat them warm. Maybe make a ganache. Sign me up for that one! Is there any way to sub out the oats/oat flour? My family can’t tolerate oats even GF oats but we love the idea of making these bars! Any suggestions? I don’t have any, but check out the comments on my Facebook page. There are some suggestions from other readers about what they usually use in place of oats. Hopefully that will help. You may want to try quinoa flakes and quinoa flour. You could also sub the oat flour with brown rice flour. But note, anytime you alter a recipe the recipe can still turn out great but may have a different taste and texture than the original. Thanks for lending a hand, and for making that last point, Michelle! GFBoy wants a batch of chocolate peanut butter filling and one with apple cinnamon. I’ll update you when I try them out. Just made some peanut butter protein bars last night…should have waited for these! Thank you for using weights in your recipes…do you have an aprox. weight for an extra large egg? I get my eggs from my CSA and they are usually on the small side. I’m jealous that you get eggs from your CSA! Extra-large eggs weigh about 65 grams out of the shell.